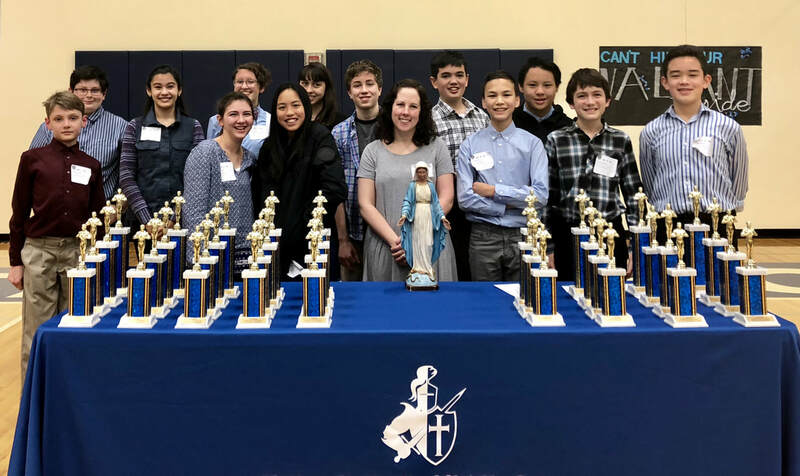 Each year our talented Titans in 6th, 7th and 8th grade have the opportunity to participate in the Valley Catholic Speech Tournament. Mrs. Gould took 13 students to the tournament where students shared extemporaneous speeches, impromptu speeches and elocution (memorized) speeches. Congratulations to Jake Cardwell, 3rd place Humorous, and Ian Rasovsky, 3rd place Serious! Jake and Ian will present their speeches to the school after Mass this Wednesday. Saturday Academy brings summer classes to Holy Trinity! Founded in 1983, Saturday Academy offers classes and camps in science, technology, engineering, math and the arts. We are pleased to offer SA classes right here at HT for the first week of August. Follow your curiosity and continue learning all summer long with classes in acting, electrical engineering, marine biology, origami, legos and more! Learn more and register here. Scholarships are available. Tuition rates for next school year are available on the HT website here (posted 11/2017). Registration fees for 2018-2019 are active now through FACTS. Please check your FACTS account for payment information. If you have any questions, please contact the office or our Business Manager, Ingrid Lowery, at ingrid@h-t.org. Registration for CYO Boys and Girls Lacrosse is open NOW! See Bonzi for more information. We will be hosting a Barn Dance for our 6th, 7th and 8th graders. Think flannels, jeans, boots, bandannas, t-shirts. We are in need of set up and early chaperone help for the middle school dance. Here’s a great way to earn share-points while having fun with other parents. Also, if you know how to two-step or are familiar with another line dance, please help us teach the middle schoolers LIVE on March 16th.​ Sign up via School Speak to help/donate TODAY for this event and/or contact lisahicks@thehgroup.com (Lisa Hicks) to get involved. Congratulations to all our Titans who worked hard all season to practice, play and celebrate basketball! Thank you to our dedicated coaches! 3rd grade girls: 6th place! 3rd grade boys: 4th place! 4th grade boys: 8th place! 5th grade boys (Eddy): 1st place! 6th grade boys: 2nd place! Beginning March 6th, PTO will host monthly all school meetings. Please bring your voice, your wonderful ideas and your willingness to create and support HT's community events. Join us: March 6th from 6:00-7:00pm in the cafeteria. Our 2nd trimester ends Friday, March 16th! Final grades will be published online Thursday, March 22nd. An email will come from the office when Report Cards are ready to view. Kids Like Languages has a spring program beginning in April. See their website for after school Spanish or Mandarin classes. Track & Field registration is open NOW! NEW CYO Store! Please visit our new TeamUnis fan page to order track and field gear. All participants must be registered in Bonzi before practicing. Coaches must be certified prior to practicing with kids. Coaches need to register in Bonzi before being certified for a badge.